Eat it with Ice Cream! One of Top Enders favourite ways to eat Leftover Yorkshire Pudding is with Ice-cream. Yorkshire Pudding is after all, just another variety of pancake! Try topping with a scoop of ice cream, some crushed biscuits (Oreo is a favourite in our house) and drizzling a little sauce over the top. The great thing about this is having it as a pudding or a sweet treat is you won't feel that you are over doing it on the Yorkshire Pudding. I tend to make a sheet of Yorkshire Pudding, as I find it comes out better when using wheat free flour. However if you make the circle versions (Muffins or buns) then with the leftovers you can make mini toad in the holes, mini Shepherds pies or even mini Fish Pies. Just cooking a few small sausages or slicing up a few larger ones and adding them to the middle of the reheated Yorkshire Pudding makes a very quick and easy meal. These are great fun for younger family members as they are the right size for them and served with beans or vegetables makes a healthy and balanced meal. Mini Shepherds or Fish Pies, just require a scoop of mince or Fish Pie mix and a spoonful or two of mashed potato to cover the top. Cheese can be added if required, which with my children it always is! If you do have left over Yorkshire pudding and you are after a sweet snack then heating up some of the leftover Yorkshire Pudding and serving with jam (as you would scones) makes an interesting snack and it will make you think twice about how you eat Yorkshire Pudding leftovers in the future. Something that I've had at a few different parties has been hors d'œuvre made with Yorkshire Pudding as the base with a slice of cold beef on top and a drizzle of Horseradish over the top. Making these small enough to eat in one mouth is a great way to make a lot of the hors d'œuvre from a small amount of leftovers and is a lovely brunch for friends or an interesting Packed Lunch addition for Grown Ups or children who like the spice of horseradish. For us we only ever have a full English breakfast on a Sunday and even then not that often and so this is something which I have yet to do myself, maybe the next bank holiday will give me a chance. The idea is that you just cook the breakfast as normal, lay the fried egg onto or scoop beans into or bean juice the Yorkshire pudding, so when you cut in to it the egg yolk gets mopped up by the Yorkshire pudding. 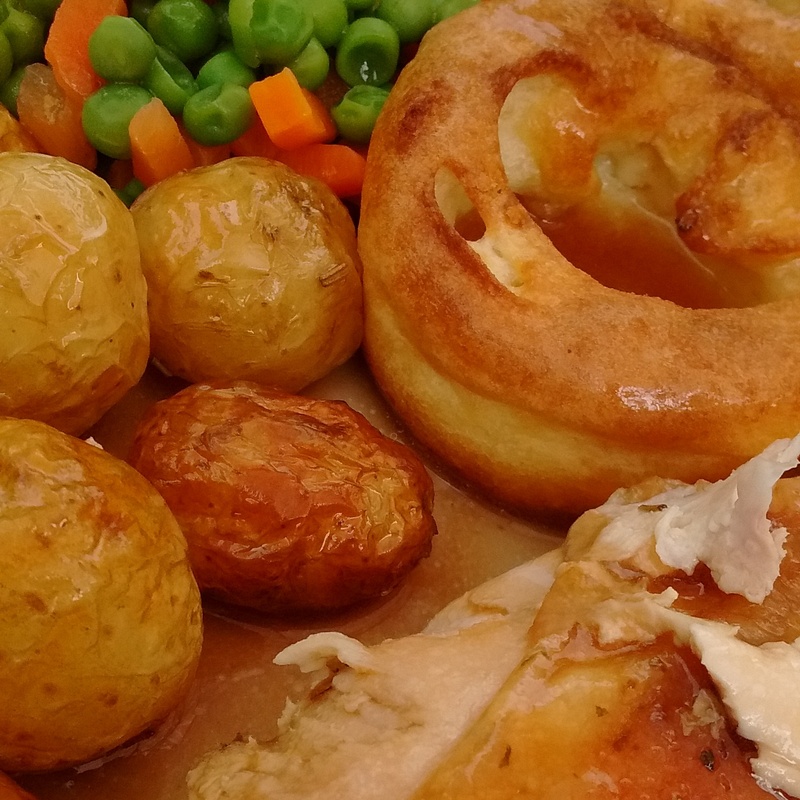 We find that any meal with gravy is always in need of a bit of Yorkshire Pudding to mop up the gravy. Sure fire winners here are meals like casseroles, mince, even bolognese for Spaghetti! But it's the Yorkshire Batter I have leftover! Of course if it's the batter that you have leftover make pancakes for your meal the next day (Savoury or Sweet) just be warned that it can become a little thick, so you might need to add a little milk or water and give it a good whisk in order to get the right consistency. Of course, you can also make a large Toad in the hole, which would totally thrill my family! 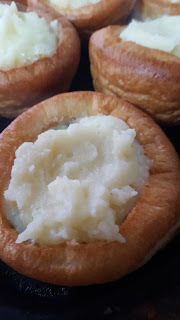 You could freeze the leftover batter for next time too, my husband prefers to make small ones ready for heating up the next time we have a roast but I prefer pouring it into small foil dishes (like the ones you can buy ready made Yorkshire Puddings in) and freezing that way. Let me know your favourite way to eat Yorkshire Puddings in the comments!